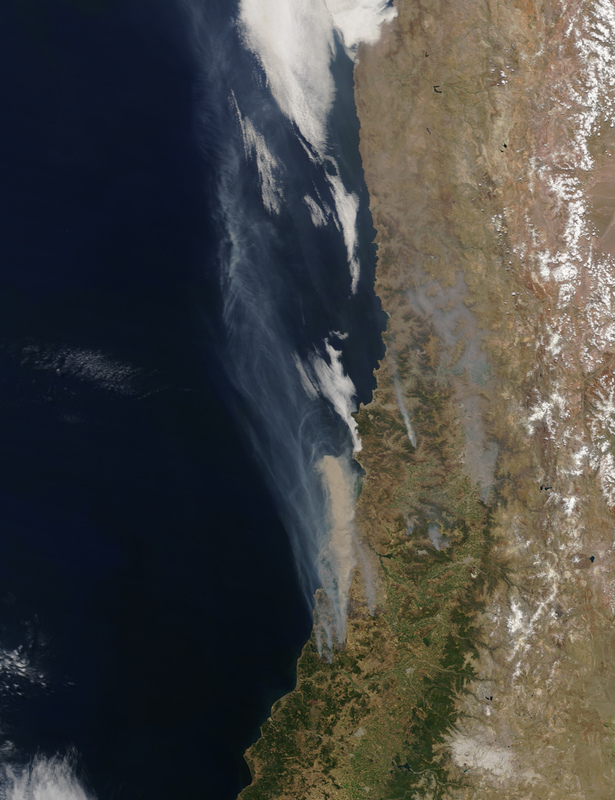 On January 20, 2017, the Moderate Resolution Imaging Spectroradiometer (MODIS) on NASA’s Terra satellite acquired an image of brown smoke billowing from a cluster of fires near the coastal city of Pichilemu. 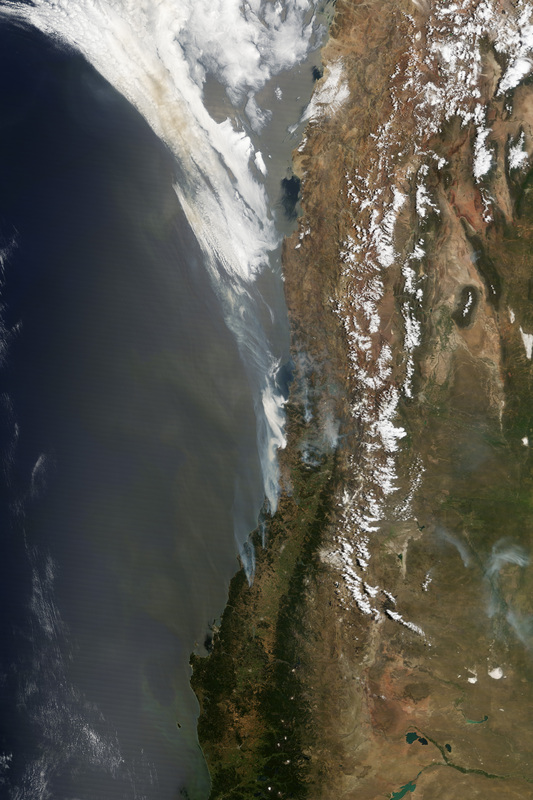 On January 20, 2017, the Moderate Resolution Imaging Spectroradiometer (MODIS) on NASA’s Terra satellite acquired an image of brown smoke billowing from a cluster of fires near the coastal city of Pichilemu. Red outlines indicate areas with heat signatures indicative of active burning. Smoke plumes stretch northward and over the Pacific Ocean. The second, wider view (below), acquired by Terra on January 21, shows fires spread across the region. Far to the north and west, brown smoke hovers over marine clouds. This view, acquired by Terra on January 21, shows fires spread across the region. Far to the north and west, brown smoke hovers over marine clouds. At least 200 people were evacuated from the Pichilemu, Radio Santiago reported. Authorities declared a red alert in Consititución on January 19, when a fire burned through commercial pine and eucalyptus forests near residential areas. Smoke from the fires also shrouded the nation’s capital, Santiago. There were 108 active forest fires registered in Chile on January 23, 2017. According to an update by the National Forest Corporation (CONAF), 62 had been controlled and three had been extinguished. The remaining 43 fires spanned an area of roughly 104,800 hectares (more than 400 square miles), according to CONAF. Chile recorded roughly 5,200 forest fires per season in the decade between 1990 and 2000, according to a report by the UN Food and Agriculture Organization. The country has a Mediterranean climate and a long dry season—conditions that facilitate fires. Chile registered more than 6,700 fires during the 2015–16 fire season. CONAF (2017, January 23) Situación nacional de incendios forestales. Accessed January 23, 2017. Radio Santiago (2017, January 21) Evacuan a más de 200 personas en Pichilemu y Paredones por avance de incendio. Cerrados los parques nacionales. Accessed January 23, 2017. Reuters (2017, January 20) Chile declares state of emergency due to massive wildfires. Accessed January 23, 2017. NASA images by Jeff Schmaltz, LANCE/EOSDIS Rapid Response. Caption by Pola Lem.